Book of Dead video slot is one of the most popular game powered by Play’n Go. The theme is based on the young handsome adventurer Rich Wilde that is on a quest to find relics and treasures in Ancient Egypt. The Egyptian themed slots are very popular amoung casino slots lovers, and this is definitely one of them.This is a 5 reel, 3 rows and 10 paying lines video slot with a theoretical return to player set to 96.21%. Players can win up to 250,000 coins in one round! While playing Book of Dead video slot, players can trigger 10 free spins by simply collecting 3 or more Book of Dead scatter and also a wild symbols on the reels. If more scatters land on the reels, more free spins are awarded. Before a free spin sequence begins, an ordinary symbol is randomly chosen to act as a special expanding symbol during the entire free-spin sequence. After prizes for regular winning combinations have been recognized, the special symbol may expand to cover all three positions on its reel. The selected symbol will expand only when additional prizes can be awarded along the active paying lines for winning combinations. In Book of Dead video slot, players can also find a gamble feature, which gives the opportunity to multiply the total winnings on any spin in the main game by correctly guessing the colour or suit of a hidden card. The Gamble round can be played up to five times in a row. Players can choose to bet from as little as 0.10 up to a maximum of $£€50 or equivalent. Although Book of Dead was released on the 14th of January 2016, and was one of the first Play’n Go video slots, it is still one of the most popular games available in their games catalogue. So join Rich Wilde on his treasure hunt and face Anubis and find the mystical Egyptian artifacts! 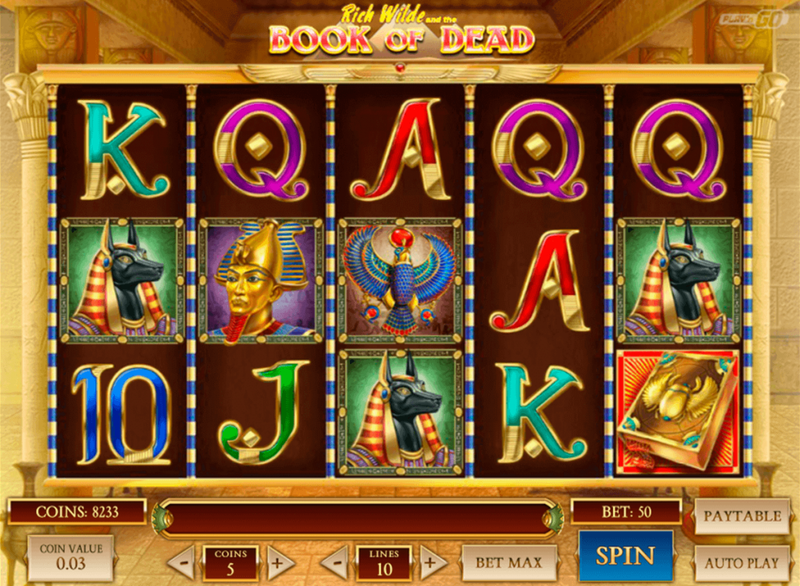 Featured: Get No Deposit Spins on Book of Dead! « New Casino Bonuses November 2018!